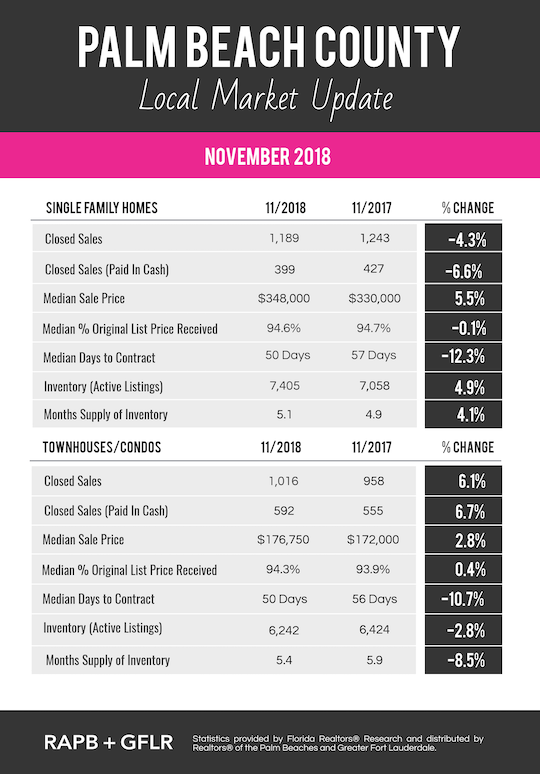 Check out the Palm Beach County Local Real Estate Market Update for November 2018. The following market update summary is based on newly released statistics reported by the Florida Realtors®, with a year-over-year snapshot comparison of 2017 & 2018 market data for the month of November. The November 2018 market stats from the Florida Realtors® reveal that 54 less single-family homes have sold in Palm Beach County in November 2018 as compared to November 2017, representing a 4.3% year-to-year decrease in total closed home sales. On the contrary, condo & townhome sales in Palm Beach County show an increase of 6.1%, with a total of 58 more condo/townhome sales in November 2018 compared to this time last year.